One of my favorite stores in the area is Haley's Cottage. I keep teasing my friend Cindy who owns it that someday she has to sell it to me! I went in today to visit and check out all the cool things. I got a really neat candlestick, but could have walked out with a lot more! 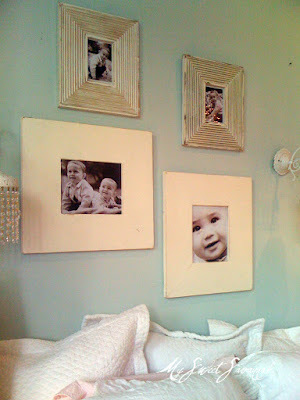 One of my favorite things in the store are these frames! Of course, I may be a little biased seeing as how I made them! 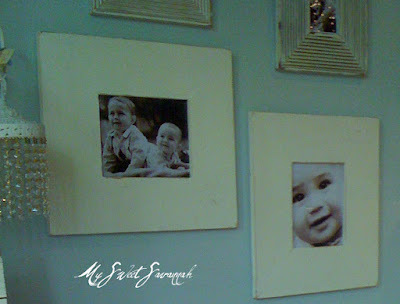 She has them on her wall with her adorable little grand babies in them! If you are ever in the Mill Creek area of Washington be sure to stop by! And if you think I should sell these frames in my etsy store, leave me a comment! I can do them in any color or size with embellishments or simple and plain. Your a quick blogger. Picture frames look great. I think we need a whole wall of them! They look amazing. You did a great job! 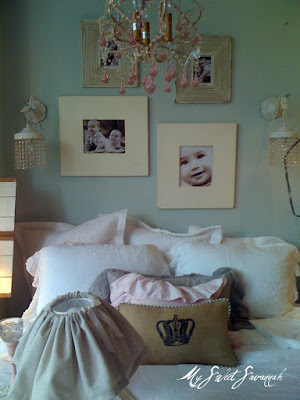 I love the pillow in the last photo, the burlap fabric with the crown, where can I find one of these, and yes the fames are awesome, and I would purchase some from you if you sell them, I wish I could send you my photo's and you put them in the frame with wire on the back, and send them back, ready to hang on the wall! I also wish you knew someone in Houston, Texas, who specialized in hanging groups of family photos professionally. 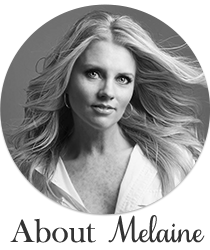 I love the listing where you gave the link to Farmhouse Wares, I enjoyed shopping with them. Have you ever heard of Kathy Womack, she is a Artist? You would love her, follow the link on my blog to check her out at: www.happilyeverafterhome.blogspot.com. Have a great weekend! yes, please sell those frames on Etsy.. i love them!!! you create fabulous stuff!!! I definitely think you should put them in your Etsy store! They are really great. Yes, definately think you should sell these in your store!! :) I'm trying to figure out a good spot in my house for them! Beautiful room, beautiful frames. I love the wall colour.